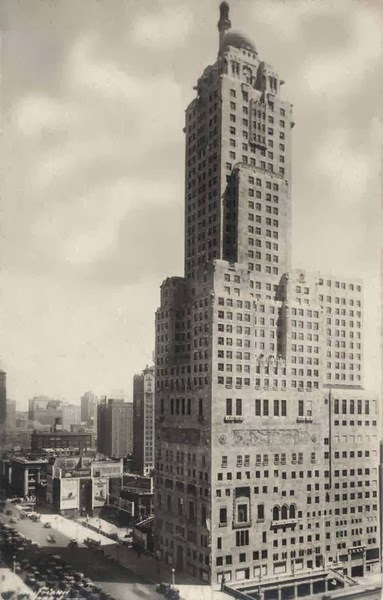 On this date back in 1927 the Mayor of Chicago, William Hale “Big Bill” Thompson, turned up the first shovel full of dirt at the site of what would become the Medinah Athletic Club’s 42-story headquarters. A little over 18 months later the $8,000,000 masterpiece, today the home of the Hotel InterContinental, would be complete. They built ‘em fast back in those days. Unfortunately, the days of skyscraper glory that were the 1920’s were just about over when the building opened. The architect, Walter W. Ahlschlager, was a big name. As the Medinah Athletic Club was being built, the Beacon Theatre and Hotel on Manhattan’s Upper West Side, where the Allman Brothers have plugged in for over 200 shows, was being finished as well as Mr. Ahlschlager’s 5,920 seat Roxy Theatre, now gone. The designer’s 49-story Carew Tower in Cincinnati, still the second-tallest building in that city, would follow Chicago’s tower. 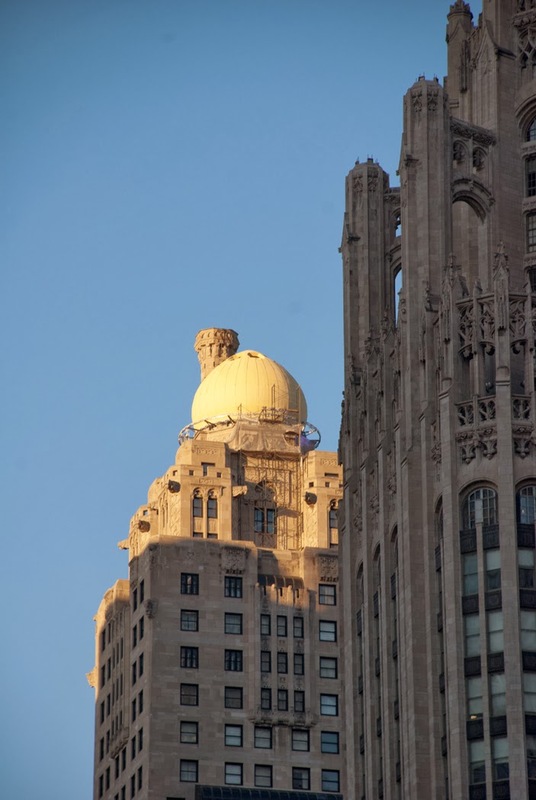 Built toward the end of Chicago’s frenzied love affair with the Art-Deco style the Medinah Athletic Club fronts Michigan Avenue with an eclectic design style that draws its share of attention. If Tribune Tower, just to the south, seems a little disconcerting with its Art Deco shaft and Gothic top knot of flying buttresses, then Medinah is a screaming wild child, a mash-up of decorative styles from Turkey, Persia, France, Egypt, Italy, the Nordic countries and Assyria with just enough Art Deco thrown in to make it a 1920’s building. At the eighth floor there are those unmistakable relief carvings, each of the three friezes depicting a different scene. There is Wisdom on the north wall, Consecration of the west, and Contribution to the south [The History of the Medinah Athletic Club and the Intercontinental Chicago, InterContinental Chicago]. 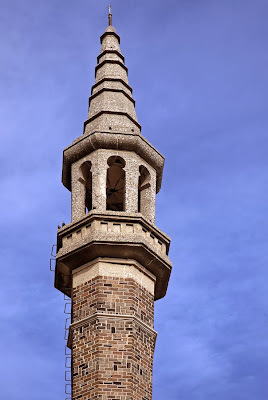 Most noteworthy is that wacky gold Moorish dome at the top of the building. 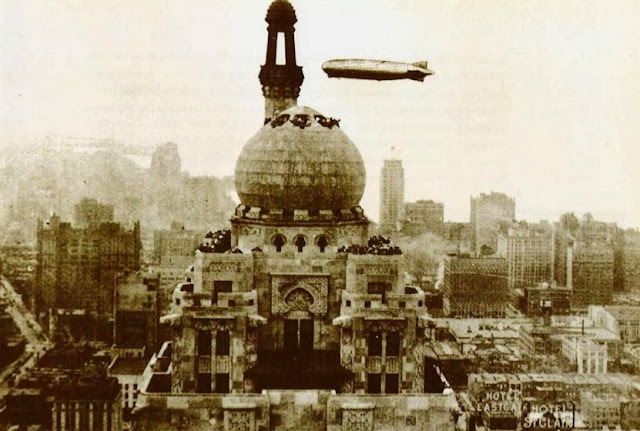 Referencing the eastern mysteries of the Ancient Order of Nobles of the Mystic Shrine, the dome, so the story goes, was originally designed for use as a dirigible dock until 35 people perished in the Hindenburg disaster at Lakehurst, New Jersey, and the plan was abandoned. But, of course, the great German airship’s demise in 1937 occurred eight years after the Medinah Athletic Club opened, and no record of any dirigible making an attempt to dock at the building exists. in the middle of a major city? I would have made the decision to stay on board. Note the "mooring mast," by the way . . . Pass by a tall building on a reasonably windy day, and common sense will tell you that no rational human being, not even the most fearless of aviators, would want to maneuver an unwieldy behemoth near a 42-story building, smack-dab in the middle of a major city, much less try to disembark from it. But it makes for a good story. was made to look like something else . . .
More likely is this explanation . . . There were many other lavish touches within the tower. A miniature golf course on the twenty-third floor, complete with water hazards and a babbling brook. A shooting range, a billiards hall, running track, gym, archery range, bowling alley, a two-story boxing arena – all these and more filled the pleasure palace. The fourteenth-floor pool was an aquatic extravaganza with exquisite tile and a fountain of Neptune. The Grand Ballroom contained a six-ton Baccarat crystal chandelier, the largest on the continent at the time. All of this, plus 440 guest rooms, for the club’s 3,500 members. Occupancy on opening day in 1929 was just over 30 percent, and by 1934 the Shriners had lost their masterpiece in the financial meltdown of the Depression. Since then the strange tower with its surprising ornament, its idiosyncratic setbacks, and its “mooring mast” and gold dome has led an equally eccentric life, serving in a range of roles from apartment building to the site of a Kon Tiki Ports restaurant. It has been, at various times, a Radisson Hotel, a Sheraton Hotel, and since 1990 the InterContinental Chicago. The glory. And the fall. And the glory once more. A continuing theme in a city in which that cycle plays out again and again and again. I really enjoyed reading about this. It is one of the most curious sights as you walk up N. Michigan Ave.
And now I know the rest of the story. Quite a history and quite a place!